"So singular in each particular." The Utah Shakespeare Festival is a destination theatre that presents life-affirming classical and contemporary plays and musicals, in rotating repertory, and interactive experiences. All of our work is intended to entertain, educate, and enrich regional and national audiences. The vision of the Utah Shakespeare Festival is to create impactful theatre that reflects and celebrates the emotional complexity of our collective humanity. We embrace all members of our community with a deep commitment to being fair, trustworthy, and honest. We recognize and respect the diverse and unifying interests and goals of the people we serve including our audiences, artists, donors, staff, and national theatre community. We strive to serve as a good citizen of our university, city, state, and country. We are committed to the highest level of theatrical artistry. We pursue, throughout the organization, talented, dedicated, bold, and creative individuals. Collaboration is the essence of our creative process. This process is the best way to not only truly fulfill our artistic vision but to optimize our work as administrators, technicians, and artisans. Our best work is possible when every individual can bring their authentic self to an environment of acceptance and mutual respect. As we attract people with underrepresented voices and value their contributions we amplify our ability to fulfill our mission. As stewards of a more than fifty-year-old arts institution, we recognize that the creation of great theatrical art is predicated on effective and sensible financial and business practices. Southern Utah University’s more than 150 undergraduate and nine graduate programs across six academic colleges are fully accredited, but the university is much more than classrooms and textbooks. SUU is the only university in Utah to guarantee every one of our 8,000 students will graduate with a diploma and field experience, through internships, undergraduate research, or study abroad. The philosophy at the university is that four years of tuition should get you a job you love, not just a fancy piece of paper. In 2001 the National Governors Association honored the Utah Shakespeare Festival with the award for Distinguished Service in the Arts for Artistic Production at its ninety-third annual meeting in Providence, Rhode Island. The award recognizes outstanding service to the arts, focusing on contributions that improve the quality of life and bring distinction to the state or community. The Festival’s fiftieth anniversary production of A Midsummer Night’s Dream was the subject of a regional Emmy Award-winning live broadcast by BYUtv, Provo, Utah. The award was for the best special event coverage, live or edited. This was the first live broadcast of a performance in the Festival’s history. The Utah Shakespeare Festival has also been the recipient of numerous other awards, including the Best of State Award in arts and entertainment. In addition Festival Founder Fred C. Adams was named Utah’s 2003 Entrepreneur of the Year for Community Enrichment by Ernst & Young, and in 2010 received both the Utah Governor’s Award in the Humanities and the Burbage Award for a lifetime of service to the international Shakespearean theatre community. The Festival has grown from a budget of under $1,000 in 1961 to over $7 million today. Approximately 74 percent of the Festival’s budget is funded from ticket sales, concessions, merchandise, and education classes, with the remaining support coming from contributed income such as memberships, grants, and foundations. The Festival’s economic impact in Cedar City and the surrounding area is enormous. In a 2012 study by Neil Abercrombie and Dr. Kelly Matthews, the total economic impact was estimated at more than $35 million annually. In 1962, the Festival attracted 3,276 visitors. Today, the audience is nearly 120,000. Approximately 60 percent of the audience comes from Utah; 24 percent from Nevada; 6 percent from Arizona; 6 percent from California; and 4 percent from other areas. The home of the Utah Shakespeare Festival is at the Beverley Taylor Sorenson Center for the Arts on the campus of Southern Utah University. This exciting $39.1 million dollar arts complex was dedicated July 7, 2016. It includes three theatres used by the Festival: The outdoor Engelstad Shakespeare Theatre, the beautiful Randall L. Jones Theatre, and the 200-seat black box Eileen and Allen Anes Studio Theatre. In addition, the center includes the magnificent Southern Utah Museum of Art, as well as office, rehearsal, educational, and artistic space for the Festival. The buildings are surrounded by gardens, sculpture gardens, a seminar grove, a Greenshow performance space and much more. The Engelstad Shakespeare Theatre celebrated its opening night on July 7, 2016. It is an open-air space, reminiscent of Elizabethan theatres but with modern amenities and technology. As the symbolic home of the Utah Shakespeare Festival, it features plays by Shakespeare and other playwrights whose works are appropriate for its outdoor Elizabethan-inspired architecture. It is also used for educational programming for Southern Utah University. The theatre seats approximately 921 and is named for the Ralph J. and Betty Engelstad family which was a major donor toward the building. The stunning Randall L. Jones Theatre opened June 23, 1989, as a new indoor space for the Utah Shakespeare Festival to offer classics of world drama, “Shakespeares of other lands.” It is also a performance space for Southern Utah University during the academic calendar. The theatre seats approximately 770 and has been recognized nationally for its architectural beauty. It is named after a Cedar City native known as the father of tourism in southern Utah and whose family was a major donor toward the building. The Eileen and Allen Anes Studio Theatre opened its doors on July 30, 2016. It was designed to showcase smaller, more intimate shows for the Utah Shakespeare Festival and as a home for its new plays program, highlighting the “Shakespeares of tomorrow.” This space allows the Festival to extend its offerings throughout the year. The theatre is named for long-time supporters Eileen and Allen Anes who were major donors toward the building. It provides flexible seating for approximately 200. The first few years of the Festival, plays were presented on a platform that was put up before each season and taken down at the end. The Utah Shakespeare Festival was founded in 1961 and presented its first season in 1962. It was started in response to two influences: An estimated quarter of a million summer tourists desiring more evening activities after visiting the area’s national parks, and a young entrepreneur and actor’s desire to produce great theatre. Festival Founder Fred C. Adams, having joined the faculty in 1959 as an assistant professor of theatre arts at what was then the College of Southern Utah (now Southern Utah University), was wondering what could draw people off the newly planned I-15 freeway to stop in Cedar City for awhile. City leaders were desperate to find a way to attract people and dollars to Cedar City and its Main Street. The dream was launched. Adams approached the Cedar City Council and the Chamber of Commerce and told them he had the solution to attract people to Cedar City. Their reaction was predictable. “The idea went over like a pregnant pole vaulter,” Adams likes to say. “They thought it was a dumb idea. Really dumb.” But the local Lions Club agreed to underwrite his plan with $1,000 after he told them he expected to recover all of the money in ticket sales. Shakespeare was a natural choice for Cedar City. Historically, the people of southern Utah have a love for drama and especially the works of Shakespeare. Adams proceeded with his new company and presented The Taming of the Shrew, Hamlet, and The Merchant of Venice that first season. 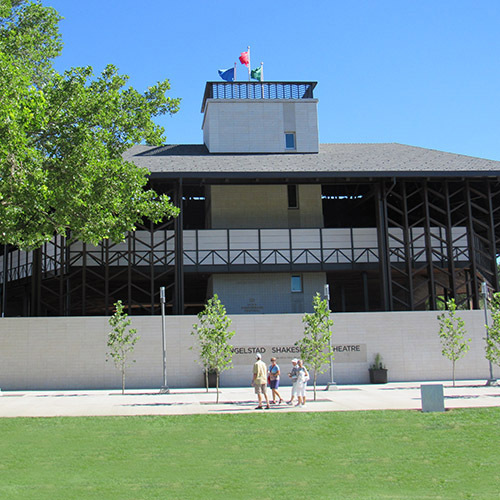 A small company of college students and townspeople produced the plays on an outdoor platform, backed by a partial replica of an Elizabethan stagehouse. Between rehearsals, volunteer actors wielded hammers and scissors, building their own stage, props, and costumes. The initial two-week season attracted an excited 3,276 spectators and yielded a much-needed $2,000 profit on which to build a second season. Barbara was adamant that the Festival include a nightly Greenshow, pre-show entertainment featuring music, dancing, and a Punch and Judy puppet show. LaVeve Whetten was in charge of the dancing; and Barbara, the music. She obtained recorders and taught a group of musicians to play the instruments. Because no one knew about the Festival, the group would go downtown in the afternoons/early evenings and wander into the cafes and play and sing medieval music and invite them to come and see the Festival that evening. For many years, Barbara was the force that kept The Greenshow improving and growing. It soon became evident that the Festival needed a permanent performing space, rather than a platform that was put up and taken down every season; so work began on a Elizabethan theatre that would serve the Festival for many years. The Adams Memorial Shakespearean Theatre began as a stagehouse; but in five years’ time was gradually surrounded by its permanent orchestra and gallery seating. The Adams Theatre was dedicated in 1977 and so closely resembled Shakespeare’s Globe Theatre in London that the British Broadcasting Company chose it as the location for some of their filming of their Shakespeare series. The popular theatre served the Festival for nearly four decades, featuring three plays each season (usually Shakespearean), mounted by professional directors, designers, and actors from around the world, along with graduate students from top professional graduate schools. The Festival discontinued use of this theatre in 2016 when it moved to the new Beverley Center for the Performing Arts. It didn’t take too many years, however, until the Adams Theatre was selling out most evenings, and Festival administrators decided it was time to expand again. The result was the indoor, modern Randall L. Jones Theatre which opened its first season June 23, 1989, offering classics of world drama. Its repertoire has spanned more than three centuries of playwrights and has included the classics of Russia, France, England, Italy, Ireland, Norway, and the United States. In 1992, the Festival started the groundwork for the New American Playwrights Project (now Words Cubed). These staged readings are presented to Festival patrons who desire an opportunity to view the current work of some of today’s best playwrights. On May 8, 2000, the Festival joined the ranks of some of America’s most famous and respected theatres when it received the coveted Tony Award for America’s Outstanding Regional Theatre. The Tony Award is the most prestigious and sought-after award in live theatre, the equivalent to the Academy Awards in film. In 2005, the Festival began setting up its managerial structure for the decades ahead. Fred C. Adams was named founder and executive producer emeritus and began concentrating his efforts on fundraising. In October 2005, R. Scott Phillips was named executive director of the Festival; in January 2011, David Ivers and Brian Vaughn were named artistic directors; and in May 2014 Zachary Murray joined them as general manager, thus completing the top management team. On July 7, 2016, the Festival celebrated the biggest event of its history with the ribbon cutting for the Beverley Sorenson Center for the Arts, including two new theatres for the Festival: the Engelstad Shakespeare Theatre (which replaced the aging Adams Shakespeare Theatre) and the Eileen and Allen Anes Studio Theatre (a new, flexible theatre which seats about 200 playgoers). These two theatres join the existing Randall L. Jones Theatre to give the Festival three very different performing spaces for the future. Anchoring the other corner of the center is the new Southern Utah Museum of Art. Also on the center are offices, a rehearsal/education hall, and other space for the Festival. This is all, of course, a part of Southern Utah University. During this season, the Festival also announced a new name, an increased commitment, and an enhanced mission for its new plays program. Formerly known as New American Playwright Project, it has now been rechristened Words3, pronounced Words Cubed and named for a line in Hamlet, “Words, words, words.” Words3 is devoted to nurturing and developing opening submitted and commissioned-based new plays by providing a professionally supported platform for readings, workshops, and fully-realized productions. It is all part of a commitment to create a diverse body of new work. Later that same year, after successfully negotiating its first season in a new center and new theatres, the Festival geared up for its next big change. Executive Director R. Scott Phillips, who was the Festival’s first full-time employee forty years ago, announced his retirement, effective March 1, 2017. Later that summer, co-artistic director David Ivers resigned, and Brian Vaughn was named sole artistic director. Finishing off the leadership transition was the announcement that Frank Mack would be the new leader of the Festival, beginning as executive producer on September 1, 2017. The management team now consists of Frank Mack as executive producer, Brian Vaughn as artistic director, and Kami Terry Paul as general manager. A six member executive council works with them as the day-to-day leadership. The Festival now plays to nearly 100,000 patrons who view almost 300 plays each year in three theatres over a sixteen-week season. It is a year-round operation with over thirty full-time employees and a budget of approximately $7 million. Each year the Festival produces eight or nine professional plays. In addition, a smaller touring production plays to schools throughout the West during the winter months. In keeping with its mission to entertain, enrich, and educate its audiences, the Festival also offers a variety of activities such as a free pre-play Greenshow, orientations, literary and production seminars, classes, workshops, and backstage tours—making it a true destination theatre, and one of Utah’s cultural treasures. The Utah Shakespeare Festival is a charter member of the Shakespeare Theatre Association (STA). The Festival operates under an agreement between the League of Resident Theatres (LORT) and Actors’ Equity Association (AEA), the union of professional actors and stage managers in the United States. It also employs stage directors and choreographers through the Stage Directors and Choreographers Society (SDC), an independent national labor union. Designers for the Utah Shakespeare Festival are represented by United Scenic Artists (USA) local #829. The programs and activities of the Utah Shakespeare Festival are sponsored in part by a grant from the National Endowment for the Arts, Washington, D.C. The Guild of the Utah Shakespeare Festival is a 501(c)(3) non-profit service organization founded to serve, support, and promote the Festival. It does so through dues, fund raising efforts, and volunteer service.